FREE HIGH SPEED WIRELESS INTERNET AND UNLIMITED PHONE CALLS TO US MAINLAND AND CANADA!! Experience island life in our luxury, spacious, one bedroom condo. Unit #22 is on the top floor and feels extra spacious because of the vaulted ceilings. This rental is offered to you directly from a local couple intent on providing you with the ultimate vacation rental experience - clean, comfortable, beautiful tropical atmosphere and décor, but most importantly - incredible value. Steve and Tamara Farwig personally own and manage their condos to ensure your much anticipated Maui adventure has a restful and peaceful space to call home - morning Kona coffee on the tropical sundeck, cool afternoon siestas or evening drinks, sunset, and barbecue by the pool. Our unit has a fabulous oceanview from the bedroom. The award-winning Grand Champions is a highly regarded tennis and golf resort in the heart of Wailea with a laid back and private atmosphere that busy hotels cannot offer. We understand potential guests may have reservations booking accommodations on the basis of internet advertising only, but we can assure that you will not be disappointed. This luxury, one-bedroom condominium is located walking distance to many of Maui's most pristine, white sand beaches - Keawakapu, Mokapu, Ulua, Wailea Beach, and Polo Beach. There is a three and one-half mile, paved, beach path that fronts five-star hotels for morning exercise or evening sunset strolls. If your heart desires to just lounge about, there are two gorgeous pool and whirlpool spa areas that also have gas barbecues and shaded tables for pool-side dining. The condominium is located two minutes away from the Shops of Wailea. There you will find terrific restaurants in all price ranges, Hawaiiana stores as well as casual wear such as The Gap and Banana Republic. Three renowned championship golf courses and 11 tennis courts surround the Grand Champions Villas providing preferential rates to our guests. We chose to own at the Grand Champions because it is located in such a beautiful place above the beach in Wailea. It is close to everything you need but still has a feeling of space and privacy. The condos are adjacent to the Wailea tennis club, Reps Gym at the Wailea town center and just a few minutes drive to seven beautiful white sand swimming beaches. There are also many great restaurants within a five minute drive or walk to Joe's Bar and Grill(one of our favorite restaurants) right next to the complex. There is a 3.5 mile oceanfront path great for morning exercise or sunset strolls. The condo was lovely, great location and the lanai was a beautiful peaceful spot to read in the heat of the afternoons. We had a great time here and would gladly come back. The place was everything they promised. Very satisfied. 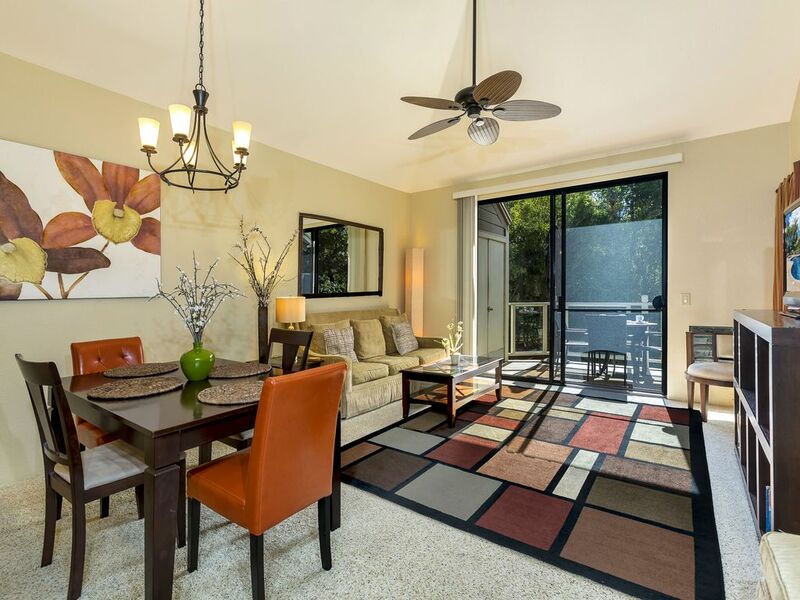 Overall take on condo: spacious everything (living area, bedroom, bathroom, lanai! ), clean, well kept... we felt great. Loved watching and listening to the bird activity from the lanai while sipping our morning coffee. -Bedroom: Great sleep quality (firm, but not hard mattress), and super nice view to the resort and ocean! -Kitchen: We gratefully used "sharing items" left by prior fellow travelers, and contributed some of our own. We also cooked, and I agree with a previous reviewer that a newer set of pans would be a plus. We very much appreciated the ice maker/ filtered refrigerated water: great tasting water, no plastic bottle litter. Other: the condo comes with helpful beach items (towels, chairs, toys, frisbee, boogie board, etc), in short many of the little things that make a big difference when you don't have them. The Grand Champions community itself is fairly quiet, and is located 5 minutes drive to some of the most awesome beach-snorkel place combos on the island (start with Ulua, and go south from there). The swimming pool is rather small, but this was not a factor for us. We did use the grills by the pool, to which I would easily give five stars. Last but not least, Tamara and Steve are prompt communicators and great to do business with! Very helpful as we sorted through the uncertainties related to hurricane Lane. Thank you for an awesome stay! Comfortable apartment in a beautiful area. The king size bed was very comfortable. Loved the condo. Everything you need for a great stay. Close to restaurants, golf and the beach. Clean and in excellent condition. Common area pools, hot tubs and BBQ's well kept and close. Had a great stay! We loved our stay here. Tamara was very easy to work with. The apartment had everything we needed. The washer and dryer came in especially handy as we were on the tail end of our trip. The beach is just a short, 2 min drive away, just beware the parking sitch at the public beaches as it is very limited. The Wailea Blue course gives a discount for guests of the Grand Champions Villas, Wailea Tennis club adjacent to complex.